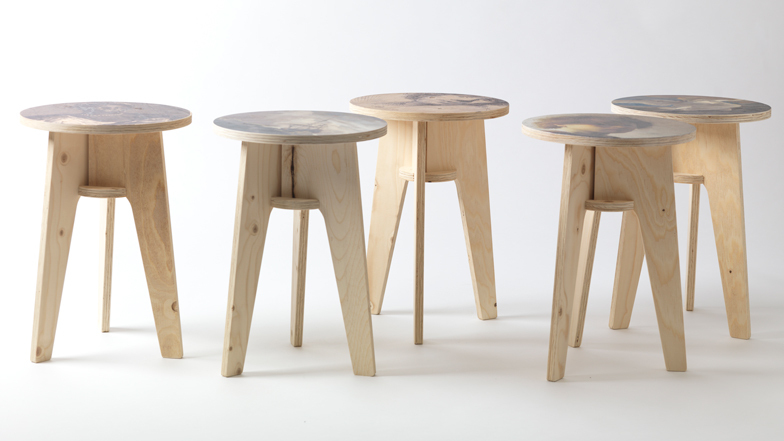 Dutch Design Week 2014: The most recognisable paintings from the art collection of Amsterdam's Rijksmuseum are printed onto the seats of these plywood stools by Dutch designer Piet Hein Eek. "This product can only exist through today's techniques, CNC wood cutting machines and wood enabled printers," said Hein Eek, who launched a range of chunky wooden furniture constructed from the small off-cuts earlier this year. "I thought it would be a great idea to combine these innovations with century-old Dutch Masters from the Rijksmuseum collection," said the designer. The Plywood Print Stool follow Hein Eek's Scrapwood Wallpaper range for the brand – a matte printed wallpaper that mimics the texture of wood – and are the first non-wallpaper product to be sold by NLXL.